In today’s highly competitive world, school children have to face a lot of mental stress, as it’s not only important to have an excellent grade at school but also participation in co-curricular activities. The all round development of the child equally depends on the involvements into school co-curricular activities. Pride walk academy is a foundation that prepares children for the future endeavors, only being brilliant does not make the student a productive citizen’s responsible citizen of the country. Given today’s scenario of the fast paced world around us children are expected to be equally active in non-academic activates. There are numerous extra curricula activities available at pride walk academy. Music, Dance, summer camps. Writing Competition, math tricks competition, art/craft competition and fashion show are just a few examples of numerous activities available through school. It is well known that only a sound body can boast of a sound mind. To fulfil this, sports should be included in school curriculum. 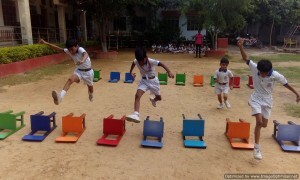 It is a fact that physical and exercises help to inculcate discipline. Every game or sport has its own set of rules. One has to follow them scrupulously. Further, sports and games give the younger’s an opportunity to lead as well as be lead. Thus, sports help to bring out and nurture the qualities of leadership. The sports facilities include a basketball, Volley ball, Football, Badminton, Cricket etc. 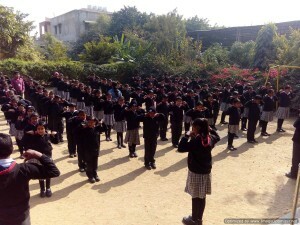 regular exercises, drill is an important feature in their time table. Teamwork, cooperation, and leadership are several things that students learn on the field with these qualities they are able to work well with others in all areas of life as well. Assembly is an integral aspect of an academic session at Pride Walk Academy, it starts with the Gayatri Mantra. Our students learn a lot through the various subjects during the session. Assembly is a way of presenting what has been learnt and understood by the students. Besides showcasing their knowledge and understanding of the various subjects, assembly aid in enhancing the confidence of the children as they perform on the stage. It helps them to get rid of the stage-fright. Pride Walk Academy also focuses on class assemblies which means 100% participation from the students, i.e. each and every child from every class in the school participates; which means a class assembly being conducted for Class: I would have all the Class: I students participating and performing on the stage. 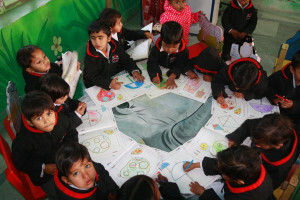 Our school has beautifully planned Activity Room that inspire children to unleash their creativity and imagination. Activity Room equipped with different facilities like: Audio Visual aids, equipped with multimedia computer and LCD TV. These audio visual aids help interactive teaching through computer. To support audio visual activities, a large number of CD/DVD’s related to subjects are available. In Activity Room techniques with pencil, markers, charcoal, pastels, and acrylic and water colours are demonstrated. Personal creativity is stressed. Art and painting activity provide children with an outlet for self expression. With the guidance provided by skilled art instructors. Students gain self confidence as they explore and develop their artistic ability. At the Activity Room every student SHINES. We provide a positive and nurturing learning experience that encourages our students to use their imagination. The seating capacity of the room is around 50 students. (a) Clothes to be properly washed and pressed. (b) Hair properly, cut, oiled and combed. (c) Nails and teeth cleaned. (d) Shoes polished & socks to be clean. 1. On his/her birthday, the student may come to the school in private dress. 2. Please DO NOT send gifts for teachers. 3. Any student improperly dressed is liable for disciplinary action.